for RealAudio version of BARK, conclusion. 1:58/118K. for TrueSpeech version of BARK, 122K. for MPEG-2 version of BARK, 459K. 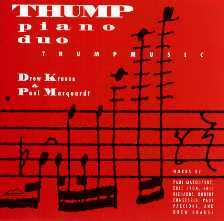 Active as a composer, conductor, and pianist (and, at various times, cab-driver, proofreader, receptionist, shoe-shiner, carpenter, typist, and busboy), Drew Krause has written numerous works for a variety of instrumental, electronic, and vegetable media. With composer/pianist Paul Marquardt he formed the THUMP Piano Duo in 1988, and has directed the Urbana, Illinois, FUNMusic [Festival of Ugly New Music] summer contemporary music festival since 1993. 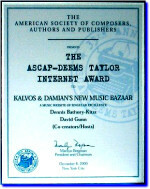 In 1996, performances of his music include ICMC (Hong Kong), SCI National Conference (Memphis), BONK (Tampa), and Wesleyan University. Dr. Krause has conducted works by many contemporary composers including Boulez, Xenakis, Braxton, Varese, Webern, Stäbler, Brün, and Marquardt, and has performed the piano music of Cage, Messiaen, Stockhausen, Martland, Feldman, Andriessen, and Lyon. A composition student of Vincent Persichetti, Bernard Rands, Herbert Brün, and Salvatore Martirano, Dr. Krause has taught for the University of Illinois, The Juilliard School, and St. Mary's College, and presently resides in Miami, Florida. His compositions and performances are recorded on New Albion, Frog Peak, New Ariel, and University of Illinois Press, and his music is published by Frog Peak.